What Does the New Millennial Working Mom Look Like? Millennial moms are a big part of the workforce. How wonderful is it that the world now is less June Cleaver and more Claire Huxtable? Working mothers have had to chart an unknown and obstacle-ridden path for decades, and now Millennials are clearing their own way. She is sharing. Both partners in a relationship share the roles more evenly in parenting now but, by and large, women (if studying a male-female relationship) are more likely to say that they will make career sacrifices for their families. See these stats from the Pew Research Center. 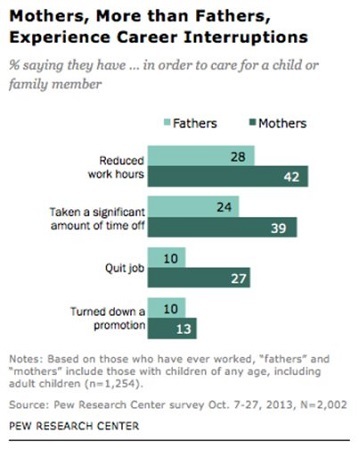 Career interruptions: mothers versus fathers. She is networked. About 90 percent of Millennial moms find social media helpful in their parenting process, using blogs, crowdsourcing, and Facebook pages as a way to stay up-to-date on the latest trends, tips, and advice for Millennial mothers (Crowdtap, 2016). She is not as common as you’d think. Progress continues to be made with a higher number of women returning to work after having a child, and there are fewer hiring discrepancies for working moms in big roles. However, the great strides that women have been taking are starting to take a dip. As of 1990, the United States boasted having one of the world’s highest employment rates for women. However, according to data from the Organization for Economic Cooperation and Development, after rates consistently climbed for more than 60 years, the percentage of women (ages 25 to 54) at work has been declining as of late, falling from 74 percent in 1999 to 69 percent today. While it’s hardly a steep drop, it is worth noting. Lack of flexibility and the ability to work from home are making qualified and successful women feel like parenthood and working don’t mix. She is ambitious but concerned. According to a Pew Research Center study in 2015, 58 percent of Millennial moms are concerned about how their parenthood will impact their careers Will the DINKy (Dual Income No Kids) peer of hers get the job instead because she has more flexibility and fewer time constraints? 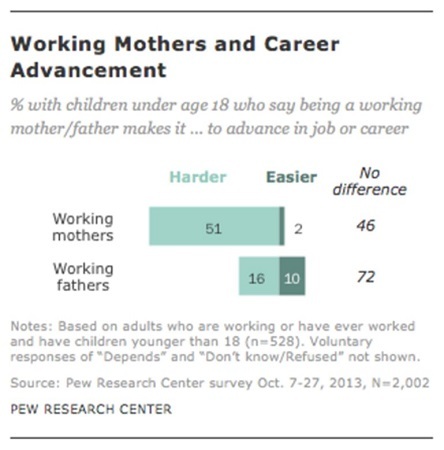 Working mothers and career advancement. Take a genuine interest in her personal life. Give her as much freedom and flexibility as possible. Support her. If you don’t know how, ask. Don’t make assumptions about what she will or won’t do after she has a baby (or two or three). Ask questions. Be sure to ask Millennial dads the same ones.